Carolina TarWheels: TarWheels to Louisville - Can they Defend their Title? TarWheels to Louisville - Can they Defend their Title? A few final practices are being crammed in over the week leading up to this year's National Tournament. The bracket has been set, rankings are final, and teams across the nation have made their plans to head out to Louisville, Kentucky. While college basketball has come to and end, the season of the National Wheelchair Basketball Association finds it's duration somewhere between that of College and NBA basketball. This season has been one in which The TarWheels have tried to keep their momentum going strong. Last year's national title was brought home along with a life long memory for members of the team, and on the car ride home oddly enough Queen's "We are the Champions" was heard not once or twice but three times and in several different cars! The team has only lost three games this year, these were all against the same team, the Richmond Rimriders. However, in their last meeting a couple months ago, The TarWheels were able to beat the Rimriders to win the tournament being held in Washington D.C. The bracket/seeding as all too often does seems to bring good rivals together. If the Richmond and TarWheels teams each win their first game, they'll be seeing each other in the following round. All teams will be playing hard, and the TarWheels know they have something of a target on their back, but to be the best, you gotta beat the best! Games are set to begin on Thursday, April 16th with the Championship game being held on the 19th. The tournament is double elimination, but a loss ensures a longer road to the final game. 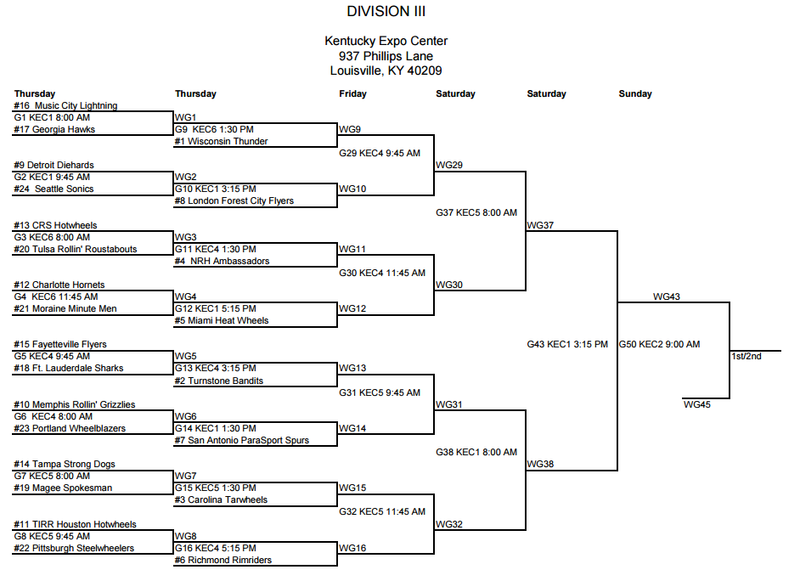 If you'd like a look at the complete bracket, click here. A couple members from last years team have moved on to new opportunities in life, one who's work has taken him to Thailand, the other was given an opportunity to play wheelchair basketball on the collegiate level! The remaining members have stayed strong though. The TarWheels have seen some tough opponents and can't wait to see how they'll fair in the 2014-2015 NWBA National Championships! Feel free to keep up with us through the website and our facebook pages! It's very encouraging to see wheelchair sports gain more and more notoriety in the sports world. Your donations and spreading the word are what keep programs like ours running. We hope to make our fans and Concord, NC proud in the coming days!